Essence Of Terror was a $14,000 purchase by EZR from the Inglis Vobis Gold sale in 2014. REWARD FOR EFFORT (AUS) (2006). 4 wins-2 at 2, MRC Blue Diamond S., Gr.1. Sire of 299 rnrs, 174 wnrs, inc. SW Gold Symphony (MRC Vain S., Gr.3), Ability, Brugal Reward, Take Pride, Blondie, Dalradian, Desert Lashes, SP Gratwick, Tuff Bickie, Fancy Rumble, Sheriff John Stone and of Effortless Reward, Hell of an Effort - D'Great Effort (Mal. ), Jevilla, Montana Star - Star Superior (H.K. ), Petite's Reward, Copy Boy, Fully Maxed, Golden Effort, etc. Essence of Terror (f. by Reward for Effort). 5 wins. See below. Ragnar Lodbrok (g. by Choisir). 2 wins at 1050m, 1100m to 2017-18 in Aust. Cwmbran. 6 wins to 1200m, A$99,095, to 2016-17, 3d ATC Tab.com.au H., Instagram at ATC Races H.
Dinner Lake. 3 wins to 1400m, A$76,135, to 2017-18, MRC Mypunter.com H., 2d MRC Ladbrokes Cash Out H.
Swingitlikesayers. 5 wins to 1200m to 2016-17 in Aust. THORN PRINCE (Thorn Park). 9 wins from 1400m to 2500m, NZ$176,700, Taumarunui Gold Cup, L, Manawatu RC Courtesy Ford H., WRC Graphic Cup, 2d Marton JC Metric Mile, Gr.3, Feilding JC Anzac H., L, Wanganui JC Challenge S., L, Feilding Gold Cup, L, WRC Mills Reef Winery H., Wanganui JC Foxton Cup, 3d Wanganui JC Challenge S., L, Taumarunui Gold Cup, L, Levin RC Trackside Villas H.
ALINKO PRINCE (Alamosa). 6 wins from 1400m to 2200m, NZ$178,887, to 2016-17, Marton Cup, L, 2d Feilding Gold Cup, L-twice, Waverley Cup, WRC HR Chalmers H., 3d Auckland Cup, Gr.1, Wellington Cup, Gr.3, Manawatu Cup, Gr.3. MY BENTLEY (I Conquer). 6 wins from 1600m to 2200m, NZ$13,175, A$292,518, Ballarat Cup, L, MVRC Swift Signs H., MRC Betfair H., 2d SAJC Penny Edition S., L, Cranbourne Cup, L, Bendigo Cup, L, Kilmore Cup, L, 3d VRC Melbourne Cup Community Fund H.
Race Record: 28 Starts 5-6-3 A$237,360. 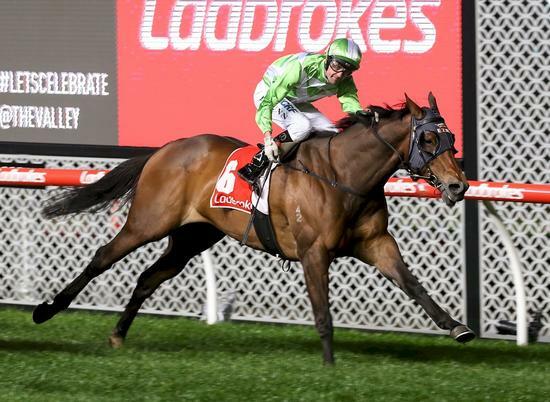 5 wins to 1200m, A$237,360, to 2018-19, MVRC Ladbrokes 55 Second Challenge H., Zouki H., 2d MVRC Ladbrokes 55 Second Challenge H., MRC Comcater H., 3d VRC Mittys H., MVRC Kerry Gillespie H.